A group of activists have prevented Lewisham Council from auctioning off five council properties and are in the process of renovating them so that some of the borough's homeless families can move in. Lewisham has 17,000 people on its housing waiting list, with 350 families living in hostels and 1,000 in temporary accommodation. Yet it has 2,000 empty residential properties. Five were recently earmarked for a bargain-basement auction, with a starting price of £140,000. 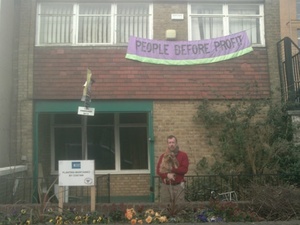 So Lewisham People Before Profit, a political organisation, occupied the houses and are renovating them in order to offer them to the most needy local homeless families. For Ray Woolford, housing adviser to the campaign, it makes no sense for the cash-strapped council to pay £40,000 a year to house families in bed & breakfast accommodation when so-called derelict homes can be done up for a fraction of the cost. 7 Angus Street, a three-bedroom house just minutes from New Cross Station, is a case in point up: it cost just £1,000 to bring it up to scratch. Now People for Profit want a housing charity to take over. "We don't want to be landlords. We want to highlight what is a national scandal — there are hundreds and thousands of homes rotting across the UK. We want Lewisham to set a lead, to be radical about housing and give its empty homes over to housing co-operatives. We could get local people off benefits and into real career pathways — Lewisham has the highest unemployment in the UK outside Scotland and this could create real jobs for local people — plumbing, carpentry, painting — it could regenerate the wider community in Lewisham." With 6,000 homeless families in London currently housed in hostels, their numbers likely to swell by another 5,000 as housing benefit changes begin to bite, and almost 5,000 residential council properties lying empty across the capital, perhaps it is time to take a leaf out of the Lewisham campaigners' book. You can support their initiative by signing the petition here. Lewisham Council will discuss its response to what it calls "the illegal occupation and recent developments" at the town hall in Catford this evening.